As we exit summer, here's a simple sauce that's perfect for using some of those wonderfully vibrant and flavorful tomatoes. They need little adornment. This recipe uses no meat and just a scant amount of aromatics to underscore the tomatoes' flavor. Yes, the simmer time is pretty long, but it's worth it. This sauce is amazing. Finishing the pasta in the sauce helps it pick up the sauce's flavor. 1. Heat the butter and olive oil in a Dutch oven over medium heat. When the butter has melted and warmed, add the onion and cook about 5 minutes, then add the garlic and season with salt and pepper. Continue cooking until they are softened and fragrant, about 5 minutes more. 2. Stir in the tomatoes, thyme, nutmeg and red chili pepper flakes, and season to taste with salt and pepper. 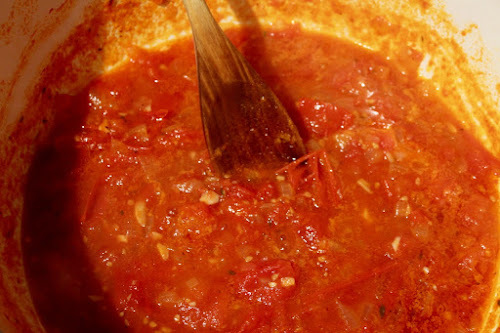 Increase heat to medium-high and bring to a boil, then reduce heat to a low simmer (medium-low or lower). Simmer for 90 minutes, stirring every 15 to 20 minutes. The mixture should bubble just slightly. 3. Cook pasta in salted water according to package directions 1 minute shy of al dente (al dente pasta is cooked through but chewy, so this pasta will be too chewy, indicating it needs more cooking time, which I'll get to in a second). Drain pasta, then stir the pasta into the simmering tomato sauce. Continue cooking the pasta in the sauce for another minute or two until the pasta is al dente (i.e. cooked through but chewy). 4. 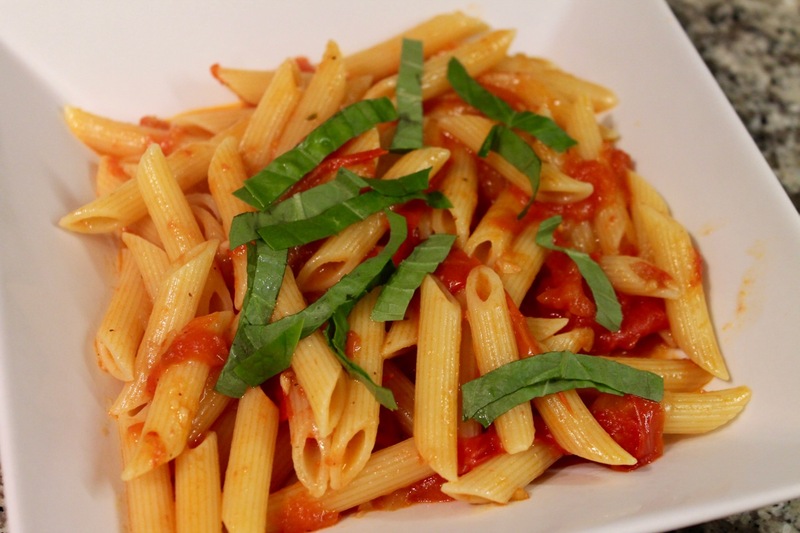 Remove the pasta from the heat and serve in shallow bowls topped with fresh basil and grated parmigiano-reggiano. Pair with a robust but not overbearing Italian red wine, such as Sassotondo Ciliegiolo.